Fayetteville police searching for a masked suspect who robbed a First Citizen's Bank. 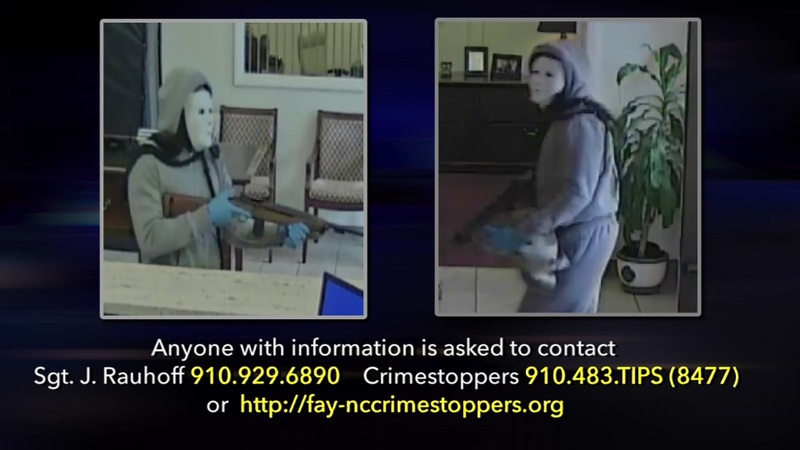 FAYETTEVILLE, N.C. (WTVD) -- Fayetteville detectives have obtained images of a masked man who robbed a bank Monday afternoon. It happened around 12:30 p.m. at the First Citizens Bank along the 100 block of Broadfoot Avenue. The suspect entered the bank with a rifle, demanded money and fled with an undisclosed amount of money. The suspect is described as a male 5'8", medium build, wearing a white plastic mask with a gray hooded sweatshirt and sweatpants. Anyone with information regarding this robbery or the identity of the suspect is asked to contact Sergeant J. Rauhoff with the Fayetteville Police Department at (910) 929-6890 or Crimestoppers at (910) 483-TIPS (8477). Crimestoppers information can also be submitted electronically, by visiting http://fay-nccrimestoppers.org and completing the anonymous online tip sheet.